I had some trees cleared on my property that really needed it. Now that I have opened up this area a bit, my neighbor is bothered by the lights from the cars and wants to install a few panels of fence that would basically benefit him, not really me. So now there is a gap between fences, since I still have a chain link fence on part of my property line and then the gap and then my neighbors fence begins. 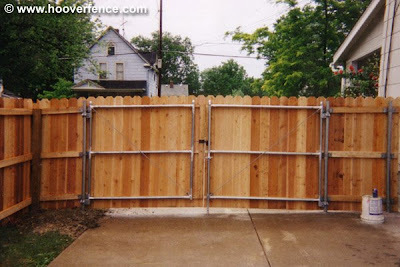 I would love to install a privacy fence there but if would probably cost about $5,000 dollars. And probably not where I should be spending my money. I would even be happy with a chain link fence right now but that would still be expensive! This fence company I talked to said they can always do it in sections which I was thinking was an idea to my neighbors issue and possibly work a bit for me. The section I was thinking I could start with involves a gate that I want to put up as part of the fencing. I think it would block the lights for my neighbor and then it would be a start for my fence. I am going to see about showing this to my neighbor as an idea. Who knows, perhaps he would split the cost!